An advisory service provided by Flight Service Station (FSS) facilities, which are located on the landing airport, using a discrete ground-to-air frequency or the tower frequency when the tower is closed. LAA services include local airport advisories, automated weather reporting with voice broadcasting, and a continuous Automated Surface Observing System (ASOS)/Automated Weather Observing Station (AWOS) data display, other continuous direct reading instruments, or manual observations available to the specialist. 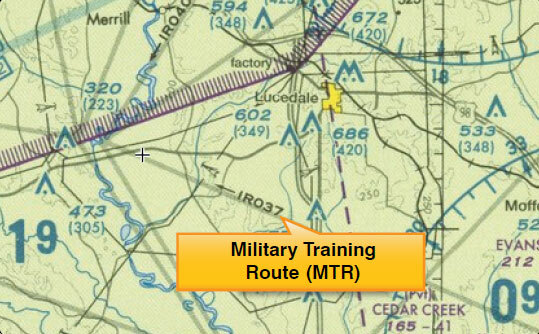 MTRs are routes used by military aircraft to maintain proficiency in tactical flying. These routes are usually established below 10,000 feet MSL for operations at speeds in excess of 250 knots. Some route segments may be defined at higher altitudes for purposes of route continuity. Routes are identified as IFR (IR), and VFR (VR), followed by a number. [Figure 15-7] MTRs with no segment above 1,500 feet AGL are identified by four number characters (e.g., IR1206, VR1207). MTRs that include one or more segments above 1,500 feet AGL are identified by three number characters (e.g., IR206, VR207). IFR low altitude en route charts depict all IR routes and all VR routes that accommodate operations above 1,500 feet AGL. IR routes are conducted in accordance with IFR regardless of weather conditions. VFR sectional charts depict military training activities, such as IR, VR, MOA, restricted area, warning area, and alert area information. Figure 15-7. Military training route (MTR) chart symbols. Prevent an unsafe congestion of sightseeing aircraft above an incident or event, that may generate a high degree of public interest. Since the events of September 11, 2001, the use of TFRs has become much more common. There have been a number of incidents of aircraft incursions into TFRs that have resulted in pilots undergoing security investigations and certificate suspensions. It is a pilot’s responsibility to be aware of TFRs in their proposed area of flight. One way to check is to visit the FAA website, www.tfr.faa.gov, and verify that there is not a TFR in the area. Parachute jump aircraft operations are published in the Chart Supplement U.S. (formerly Airport/Facility Directory). Sites that are used frequently are depicted on sectional charts. Published VFR routes are for transitioning around, under, or through some complex airspace. Terms such as VFR flyway, VFR corridor, Class B airspace VFR transition route, and terminal area VFR route have been applied to such routes. These routes are generally found on VFR terminal area planning charts.